First of all we mill the fruit to obtain a mass of the olives. In Veà this process is made with a special mill with mobile hammers in order to avoid heating the mass. After that, we mix the mass for about 40 minutes. We put the mass to 24ºC, with the intention of separating the oil from the rest. 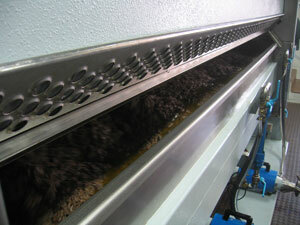 For the extraction of the oil we use the sinolea system, cold extraction with no press for about 30 minutes. To obtain 1 l. of this oil we need 10 to 12 kilos of olives. For the removal of the water and organic particles, the oil goes in to small decantation deposits, we do not use the centrifugation. Finally we make the extraction of the rest from the oil by the continua system. For this extraction we heat the mass to about 32ºC for 15 minutes, and we take the oil through the decanters.